Puerto Rico Islanders visit the Thunder for the first time in 2009 after a highly successful CONCACAF Champions League campaign. Traditional caribbean cuisine includes pina colada and creole red snapper. - Season your fillet with Homemade Adobo (or salt & pepper) to your liking. -Seal each fillet in individual foil packets or in a bowl with a lid (if you seal in foil packets there is less to clean at the end). - Marinate a couple of hours or overnight in refrigerator. -Cut tomato into 1-inch wedges. If you're using cherry tomatoes, just cut them in half. -Place in bowl, add remaining ingredients, and toss everything together. -If you're going to serve this dish right away, check seasoning and add salt or pepper if you think it needs it. If not, cover and let mixture marinate a couple of hours or overnight and taste for salt just before adding to fish. 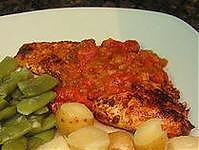 -Remove tomato mixture and fish packets from refrigerator. -Unseal tops of fish foil packets. Divide tomato mixture equally and spoon over each piece of fish. Reseal foil packets. -Line oven with piece of foil, just in case there are any drippings from the packets. Place packets in oven and bake 30 minutes. This Creole sauce is made with tomatoes, celery, bell peppers, onions, and garlic, along with seasonings, herbs, and other ingredients. Make this sauce an hour or two ahead of time for more flavor. Heat butter and oil over medium low heat in a medium saucepan. Add chopped garlic, onions, peppers, and celery. Sauté vegetables for about 2 minutes, until just tender. Meanwhile, combine the paprika, Creole seasoning, thyme, oregano, basil, Worcestershire sauce, hot sauce, and ground pepper in a small cup. Stir tomatoes into the vegetables then add the seasoning mixture. Sauté for 1 minute longer. Add chicken stock and bring to a boil. Stir in the sliced green onions. Continue boiling, uncovered, for 10 minutes. Most of the liquid will cook away. Stir in the tomato paste until blended in. Remove from heat and stir in the 2 tablespoons butter. Serve with fish, seafood, chicken, or other meat. Makes 2 to 3 cups.